Players with the blacksmithing skill can purchase the recipe for this pet at The Forge plot in the garrison or from the blacksmith vendor at the Alliance or Horde faction hub in Ashran. The recipe costs one Secret of Draenor Blacksmithing; crafting this currency has a one day cooldown. Deals double damage if the target is Burning . Devastates the enemy with a swing of Sulfuras, dealing 433 Elemental damage. Reduces up to 98.5 damage from each attack against you. 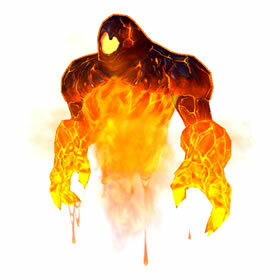 Turns the battlefield into a raging inferno, dealing 295 Elemental damage. Fire continues to Burn the enemy, dealing 98 Elemental damage each round for 2 rounds. Slumber, rebuild, and reforge, restoring 394 health on the first round, 453 health on the second, then 531 health on the third. While Reforging you cannot swap pets. Elementals ignore all negative weather effects. Enemy pets can still gain the beneficial effects from weather when facing an elemental. Very underwhelming healing move (reforge) seems more likely to end with death, rather than being healed after the 3 rounds is up. Could be very useful in the right circumstances. The layout of the move set really limits what this pet is capable of doing. This is an interesting pet. I feel like he's comparable to Emerald Proto-Whelp but with a different niche. While Reforge lacks the raw healing of Emerald Dream (especially with P/P), Soul Of The Forge does come with Extra Plating, and that 50% reduced damage taken for 3 rounds can be very useful if you want to heal through a nuke. If you are taking Reforge you probably want to take Sulfuras Smash as your damaging move, but if you opt for Flamethrower then Deep Burn becomes more effective. Currently leveling mine, he is lvl 21 and seems a bit on the weak side. Can you craft this in your garisson without have blacksmithing as a profession? You are talking of the Guardians of the Forge, a perk for having a lvl 2 blacksmith shop with a follower there. I just crafted this awesome pet and, when I was battling some mobs, I think that this pet became an assistant and started killing NPCs around me ... it was the same level as my character, level 96 and it was rather large. I need to double check this as it happened just before I logged out. Unsure if there is a cooldown. How cool is that! - Correction, I am incorrect. As stated in the post above me, the buff is from having a Level 2 Forge ... sorry. When forging enchanted steel, bits of magic seep into the coals. Over a period of years, decades even, the unbound energy slowly takes form, creating a tiny elemental being of immense fortitude.